The contents of this month’s Wonder Woman are about to be revealed!! Look away if you haven’t read it yet!! Unless you’re one of the many folks who read these reviews instead of the comic!! If you are, you’ve made a wise choice!! So the reason I’m particularly down on the book this month, other than the fact that it remains joyless, is because they killed off a new character that I really liked. Last month saw the introduction of Violet, a blue haired London street urchin who befriended the newly escaped Donna Troy. There wasn’t much to the character, really. She hooked up Donna with a new costume, and in this month’s issue they toured London together and Violet gave her some much needed advice. But she was friendly and fun and had blue hair and she seemed like a kind person. In this book, a pleasant character is rare indeed. And she got killed. She was a thief in the employ of a tough named Link, who slapped her around and then killed her when he threw her to the floor and split her head open. This was all done to further Donna Troy’s angry journey; she flipped out, beating Link soundly before Wonder Woman arrived to stop her from killing him. Wonder Woman tried to dissuade Donna from the violent life she continued to lead, but she was too furious to listen to her. Even worse, Violet’s death came in an issue that was rife with women getting beaten up by men in graphic ways. 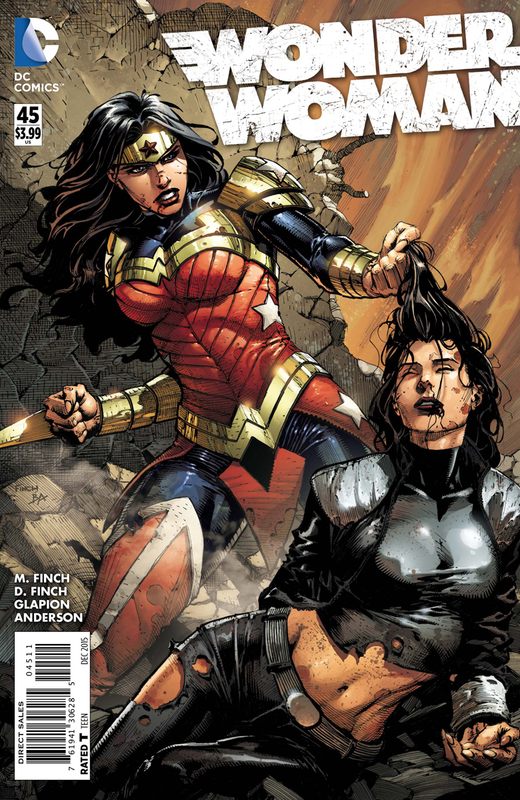 The second and third pages of the books were a double page spread of Aegeus punching Wonder Woman in the face, with her head snapping back and blood flying out of her mouth. He continued to punch her on the next page, with similar gore. Then Violet got viciously backhanded by Link before being thrown to the ground. It’s all just so unpleasant. These aren’t things I want to see over and over, much less in a double page spread. So Violet is dead and Donna is angrier than ever. Oh, and also turned to stone. Aegeus showed up at the end of the book and shot her with an arrow, trying to help Wonder Woman, oddly enough. She and Donna were fighting in the street, so Aegeus took down Donna because he’d realized the error of his ways and wanted Wonder Woman’s help in escaping the hold of the goddess he was working for. As the book’s final page revealed, this goddess was Eirene, the goddess of peace. It’s a bit of a deep cut, Greek pantheon-wise. Eirene’s not an Olympian, though in some stories she’s the daughter of Zeus, and she doesn’t play a huge role in Greek mythology. She’s more a goddess that’s invoked because of her association with peace rather than a goddess that actually gets involved with the stories as a character. She was big in Athens, with a statue and everything, but again, that was mostly a symbolic thing about peace in Athens rather than a monument to any great Eirene story. Anyway, she’s the big bad. The Finches seem to be setting up a connection between her and Ares, perhaps in a romantic way that plays on an “opposites attract” dynamic. And boy oh boy, is she ever mad that Wonder Woman killed Ares and took the mantle of god of war. I don’t know if this is a coincidence of not, but Eirene played a key role in those terrible Futures End one-shots DC put out last September. After failing to beat the mythological foe Nemesis through her god of war tactics, Wonder Woman merged with the remnants of the dead goddess Eirene to become the goddess of peace herself, with a new white costume to go along with the change. In that story, Eirene still represented peace. In the world of Meredith and David Finch, the goddess of peace seems to be all about anger, murder, and vengeance, because why not? Everybody else is. At the very least, we got some story progress in this issue after the absolute standstill of a book we got last month. We know who’s behind Aegeus now, Donna’s got herself in a real pickle being turned to stone and such, and Wonder Woman is in the middle of it all. It’s never a good sign when the best thing you can say about a comic is, “Well, something happened.” But that’s a big plus for Wonder Woman. The plot moved forward! In extremely unpleasant ways, though. So long, Violet, one of the only not terrible people in this book! You’ll be missed. This entry was posted on October 21, 2015 at 3:25 pm and is filed under WW Comics. You can follow any responses to this entry through the RSS 2.0 feed. You can leave a response, or trackback from your own site. Men beating, killing and shooting women in the back? Three.